45’ 4:3, PAL, SD, TX Channel M, 8th-14th October 2011. A heritage Lottery project by CAR Video Unit, this film shows what it was like to work in the heyday and decline of one of Lancashire's most important industries. From cotton bales to finished cloth, and from training to retirement, it covers all aspects of life and work in the industry which powered the world's first Industrial Revolution. 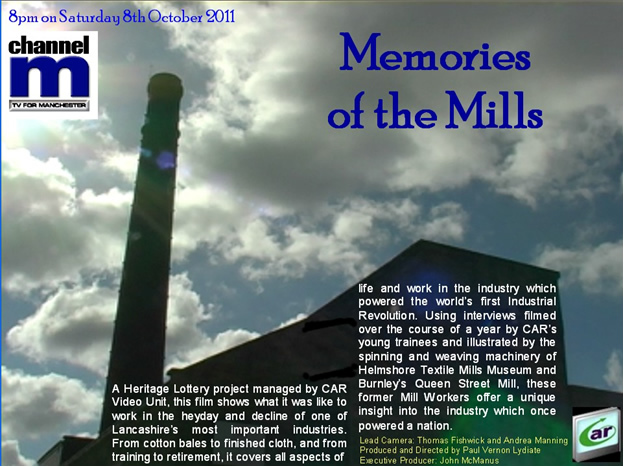 Using interviews filmed over the course of a year by CAR's young trainees and illustrated by the spinning and weaving machinery of Helmshore Textile Mills Museum and Burnley's Queen Mill Street, these former Mill Workers offer a unique insight into the industry which once powered a nation.